That's where my 66 Chevy was built. This is one of the rare buildings still standing (on Van Slyke rd) in Flint. 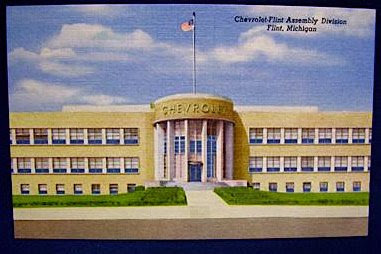 Also the first Corvette (1953) was assembled here. The last Chevy passenger car built in flint (at this location) was June 24th 1970. It was a Monte Carlo. In the early eighties Buick built the full size Impala & Caprice for one year,along side the Buick's. Here's the link to my Chevy www.myspace.com/gerrygodin . ...wasn't the first Corvette assembled at Chevy in the Hole? The building is still standing, as Kettering now owns it (the C.S. Mott Engineering and Science Center). There's even a plaque inside commemorating the building's significance. J.L., I've heard it both ways, but I suspect it came from the Van Slyke plant (the one in the postcard, which is of course now the Truck Plant). I remember there was a 50th anniversary Corvette rally, written up in Popular Mechanics or one of the car mags, and they showed a '53 Vette parked on the roof of the plant for the start of the rally (this was in 2003). I'm pretty sure it was Van Slyke. Maybe the first PRODUCTION Corvette was built at Van Slyke, and some prototypes came from the Hole. I'm guessing that's the deal. The first Corvette was built at the V 8 plant next door. The V 8 plant was built but the machinery wasn't installed. They had a fire at the Corvette plant and they installed the Corvette machinery in the V 8 plant temporarily.